X-Loupe – Use Your Canon IXUS As a Microscope | OhGizmo! By Andrew Liszewski on 08/06/06 • Leave a comment! Is regular old macro photography beginning to bore you? Well the X-Loupe adapter can really take it to the next level by turning your camera into a microscope capable of 150X magnification. Of course by ‘your camera’ I mean any Canon IXUS compact digital camera which is the only make and model the X-Loupe is compatible with. Manufactured by the Taiwan Screen Optronics company the X-Loupe adds only about 300 grams of weight to the camera it’s attached to and will work in either still or video mode. It even has a light-up LED lens ring that will properly illuminate whatever you stick in front of the lens. 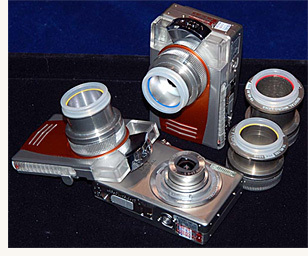 For now the X-Loupe PRO appears to be only available online bundled with a Canon IXUS 65 camera and three lenses (60, 100 and 150X) for about $1500.